This weekend, ComingSoon.net and SuperHeroHype got to tour the DC Collectibles booth at Toy Fair in New York City, and we came away with an extensive gallery that includes reveals of statues from the upcoming Justice League and Wonder Woman movies, as well as pieces from the comics, TV universe and animated series. 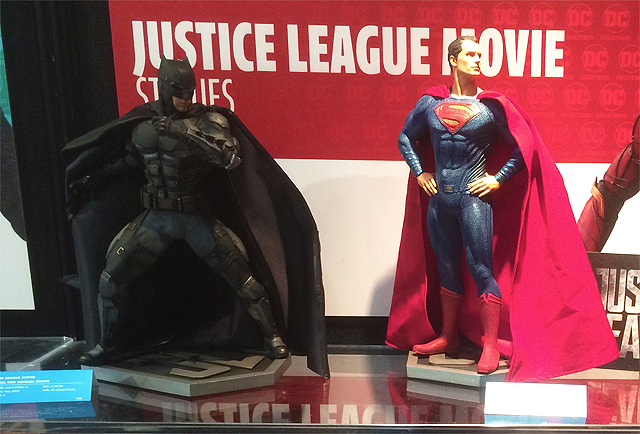 Check out our DC Collectibles gallery with over 60 photos via the link below! Justice League stars Ben Affleck as Batman, Henry Cavill as Superman, Gal Gadot as Wonder Woman, Jason Momoa as Aquaman, Ezra Miller as The Flash, Ray Fisher as Cyborg, Willem Dafoe as Nuidis Vulko, Jesse Eisenberg as Lex Luthor, Jeremy Irons as Alfred Pennyworth, Diane Lane as Martha Kent, Connie Nielsen as Queen Hippolyta, with J.K. Simmons as Commissioner Gordon, and Amy Adams as Lois Lane. While not in the official Justice League cast list released by Warner Bros., it is expected that Ciarán Hinds will play Steppenwolf, Amber Heard will appear as Mera, and Kiersey Clemons will appear as Iris West. Directed by Zack Snyder, the screenplay is by Chris Terrio from a story by Snyder and Terrio. The producers are Charles Roven, Deborah Snyder, Jon Berg and Geoff Johns. The executive producers are Jim Rowe, Wesley Coller, Curt Kanemoto, Chris Terrio and Ben Affleck. Justice League will open in theaters on November 10, 2017. Directed by Patty Jenkins, the film is being produced by Charles Roven, Zack Snyder and Deborah Snyder, with Richard Suckle, Stephen Jones, Wesley Coller, Geoff Johns and Rebecca Roven serving as executive producers. Wonder Woman opens in theaters on June 2, 2017.